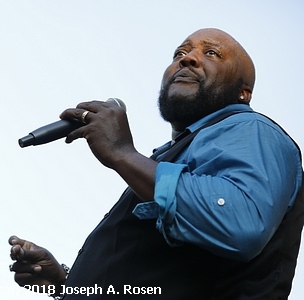 Decades years later, after several bands, three solo albums, and an appearance at this year’s Blues Music Awards, he sees his past in perspective. The Marines were a ticket out of a childhood that had been fraught with a combination of horror and tough love as one of three brothers literally starving to death as their mother slowly died of cancer. She passed away when he was 11. “My mother, God bless her soul, wasn’t the greatest mom in the world. I think she as too young and hadn’t got a good home life. Ninety five percent of my life mostly I was raised by my grandmother. Under his grandmother’s roof, Sugaray and his brothers ate every day and went to church every day, too. He grew up in gospel church and became a choir director. At 16 he was with the Inspirational 300-plus-member Youth Choir and had the chance to work with some legendary gospel bands like “The Jackson Southernaries,” “Mighty Clouds Of Joy” and many others. The church gave Sugaray the experience that would stand him in good stead when he went secular after leaving the Marines. No one in the family objected to his leaving his religious musical roots. “She never said a thing (about my playing secular music). I don’t know if she even knew it till the last couple years of her life. I’m pretty sure my aunts told her. They’ve always been very proud. My brothers are very proud, but Big Mama never said much about it. One thing for me was just respect. A lot of people wanted me to do gospel and out of respect for my grandmother I’ve always said ’cause she always said, ‘You’re either in or out,’ and I just don’t feel right doing gospel after doing blues or soul music farther on. What I sing is from my heart, my soul. So, I haven’t been able to cross that bridge. 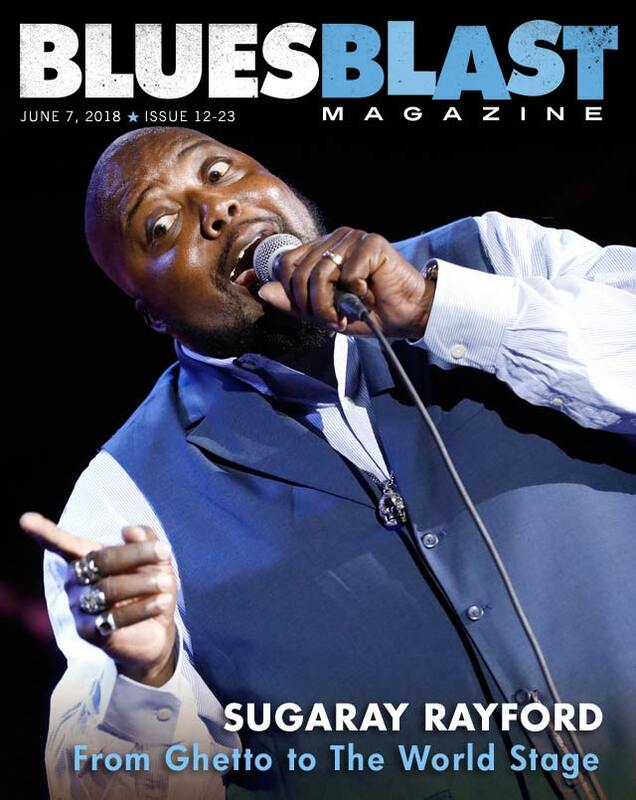 One thing Sugaray learned from the church that he’s applied to soul, R&B, and blues singing is to pour his life experiences into every song he sings whether he wrote it or not. “I was brought up in the ghetto as well as in the country and grew up in the church, and we were always taught you can sing a lie easier than you can tell a lie, and what that means to me is, when I’m writing a song or someone else has written it, I’ve done a lotta living. So, I’ve actually lived most of every song I’ve ever done. So, singing is like playing the drums. (He’s been playing drums since he was five.) Everybody knows the difference between a drum beater and a drum player. “A drum player makes the drums sound musical. A drum beater is making all that noise. So, vocally, this music – whether it be blues, gospel, soul, jazz, not so much rock and roll or country – is all about the story, and if you cannot put your horse in and have empathy for the story, you’re just making noise. But if you’re into the story and really understand what the lyrics are about, you get to live some of it. Then, you can give that ring of truth to your singing. “You can’t fake that. You can listen to an album. You can listen to a video. You can see those who are singing a song or moving. You know they’ve been through that, that they’re singing about something that’s real, not just words someone wrote on a page, and that’s the difference between these singers and pretenders. Blues was not the first secular music he played. He started singing contemporary music in a group called the Urban Gypsies in 2003 and became lead vocalist in Aunt Kizzy’z Boyz in 2004. Asked to compare the two, he chuckles. “Wow. They’re literally night and day. My wife convinced me to get back into music. My first band was called the Urban Gypsies, and it was a soul, funk and R&B cover band, and then they got really big and dominated the soul and R&B scene in southern California, San Diego, and all of that area. “But it wasn’t enough. I wanted to go further. I wanted to do original material, and all the guys in the band had been in big bands before. They didn’t want to go to rehearsal. They were happy with playing the (hits) with some of the bigger venues as the opening band or come in a cover band and do that, but I wanted more. “Aunt Kizzy’s Boyz was straight ahead blues band and a little bit of a rock twist with a couple of people in the band, but we were a straight-ahead blues band. So, I left my old band. I left the Urban Gypsies and a good friend of mine, Jim Moreno who used to be with the Ink Spots – the Crickets told me, ‘You need to be in a blues band. You can go far in the blues,’ and I was like, ‘It is close to the gospel thing,’ and I left the cover band. “I went one night and sat in for a jam, my first actual blues jam. I sat in with a real band, but I had never sat in with a blues band. So, I went there and a lot of people knew who I was. They knew me from the soul, R&B stuff. And there was this guy Duane on the drums and some other cats around. They’re playing blues, and I only knew about five songs. I knew B. B. King’s “3 O’clock in The Morning Blues.” I would sing that one. I was singing “Further On Up The Road” by Bobby Blue Bland. Gosh, I can’t remember. My wife’s memory is much better than mine, but I know “3 O’Clock in The Morning Blues” by B. B. King, “Further On Up The Road,” and I think a couple of old shuffles or something I remember. That was it. “Gospel people were different that way. They would just come up on stage. I used to tell people when you go to church you see all these great gospel singers and players ’cause by the time they get to sit in their chairs or stand up in front of their mikes in front of that choir, they’ve gone through the Crucible. “They go through their American Idol, long, long before those shows were even thought about in the church. You were in the Crucible before you were in the church. You were in the Crucible before you were ever allowed to do that. By the time you got up there to direct the choir, play that organ, play the drums, be lead singer, you were a veteran. “I joined the band. Six months later, we were doing our first album. Trunk Full of Blues. Then, we went down and competed in the International Blues Challenge. That was 2005. We played a lot of shows. Then, we went to Europe and things were going great, and I did that, probably 200 shows a year. Sugaray’s wife Pam is a certified nurse and also his manager. The most important piece of advice she’s ever given him is to be himself. Under her direction, he’s released four solo albums and toured as lead singer of the Mannish Boys. 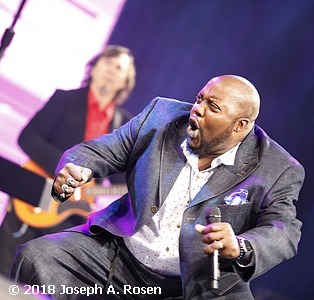 I saw him in that role last year at the Chenango Blues Festival where he popped out of the group with spirited performance that reminded me of Howlin’ Wolf in his heyday. Last year he recorded an album of original soul songs in the 1960s tradition for an Italian entrepreneur, The World That We Live In. “Between you and I, it was probably the best works and songs that I’ve done since I got in the music business. I had no idea how the blues world was gonna take to this, but everybody was, ‘This is a great album. You should do this.’ Once the album came out and I listened to it, I was floored. I’m still floored. I still will come in sometimes and listen to some of the songs. They’re so heart felt, steeped in the emotion and the way they’re done, these guys wanted to recreate the old soul, feel with a soul singer. 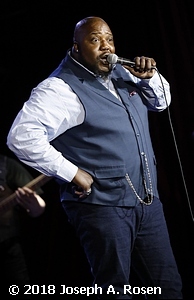 In 2017 Sugaray was nominated for two Blues Music Awards, The B. B. 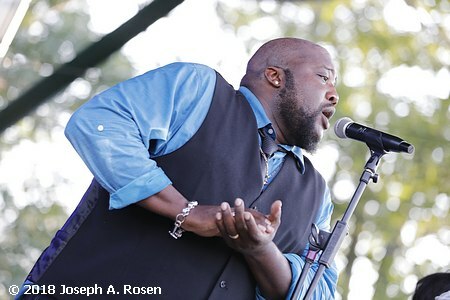 King Entertainer of the Year Award and Contemporary Blues Male Artist of the Year Award. In May of this year he performed “I Don’t Regret A Mile” from his Italian album at the Blues Music Awards in Memphis. He was on second and had five minutes to rehearse with a house band. It didn’t phase him.